Thomas Dunne Books, 9781250148957, 304pp. A book examining the strange terrain of Nazi sympathizers, nonintervention campaigners and other voices in America who advocated on behalf of Nazi Germany in the years before World War II. Americans who remember World War II reminisce about how it brought the country together. The less popular truth behind this warm nostalgia: until the attack on Pearl Harbor, America was deeply, dangerously divided. 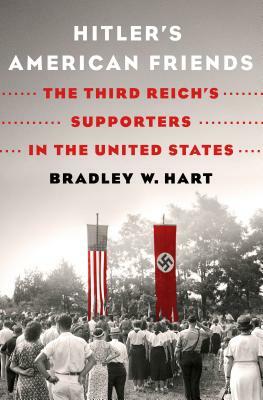 Bradley W. Hart's Hitler's American Friends exposes the homegrown antagonists who sought to protect and promote Hitler, leave Europeans (and especially European Jews) to fend for themselves, and elevate the Nazi regime. Some of these friends were Americans of German heritage who joined the Bund, whose leadership dreamed of installing a stateside Führer. Some were as bizarre and hair-raising as the Silver Shirt Legion, run by an eccentric who claimed that Hitler fulfilled a religious prophesy. Some were Midwestern Catholics like Father Charles Coughlin, an early right-wing radio star who broadcast anti-Semitic tirades. They were even members of Congress who used their franking privilege—sending mail at cost to American taxpayers—to distribute German propaganda. And celebrity pilot Charles Lindbergh ended up speaking for them all at the America First Committee. We try to tell ourselves it couldn't happen here, but Americans are not immune to the lure of fascism. Hitler's American Friends is a powerful look at how the forces of evil manipulate ordinary people, how we stepped back from the ledge, and the disturbing ease with which we could return to it. Bradley W. Hart is Assistant Professor at California State University, Fresno, USA and a former by-fellow of Churchill College, Cambridge, UK. His previous works include a co-edited volume entitled The Foundations of the British Conservative Party: Essays on Conservatism from Lord Salisbury to David Cameron (2013).